Weather – Variable. Some days were pretty windy and rough. Others were nice. Some localized showers. Highs were in the high 70’s. Nighttime lows low 60’s. Water – You’d think it should be cooler than normal, but the fact that dorado are around indicates some warm waters. Fishing – If the weather was good, it was fishable and some surprising catches with a nice mixed bag. If weather was not so good, then it made it tough. Live bait is not easy to get because of the erratic water. However, lures and dead bait seem to work fine. Got dorado, skipjack, bonito, jack crevalle, small yellowtail and sierra this week. Everyone got fish! Forecast – Some high winds early in the week. Probably won’t be fishing. Then, gets better. Highs in the low 70’s and lows to the high 50’s. Partially cloudy skies. 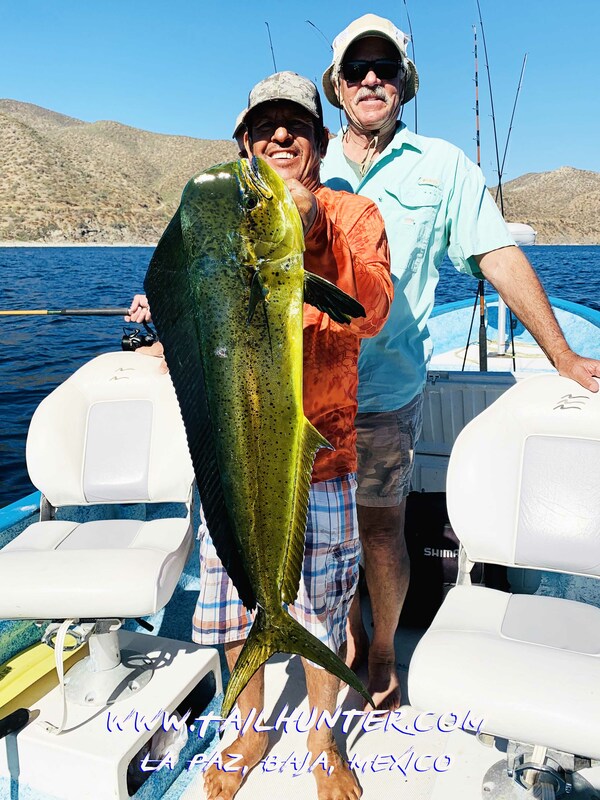 Chuck Chandler from Alaska and staying at Rancho Costa there in Muertos Bay near La Paz found some great sunshine and this big-headed bull dorado (mahi mahi) that no doubtedly hit the grill. Our Captain Jorge put his guys on some dorado like this as he photobombs on the beach. 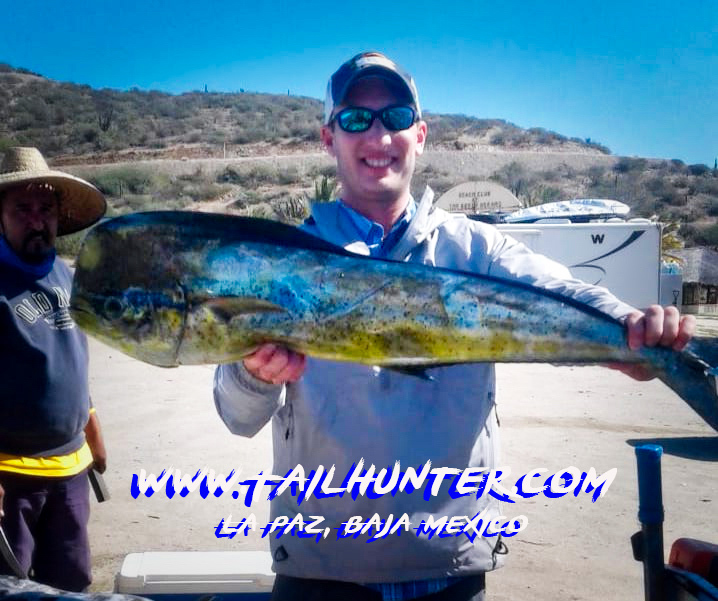 Gary Wagner loves light tackle and got this colorful bull dorado of Bahia Muertos near his place. Hope you’re enjoying or enjoyed a great holiday Martin Luther King weekend! It was an up-and-down week dictated by the weather and winds which is typical of this time of the year. Earlier in the week it was calm although there were some incidents of localized rain mixed with sunshine. Later in the week, winds got stronger generating some rougher water. 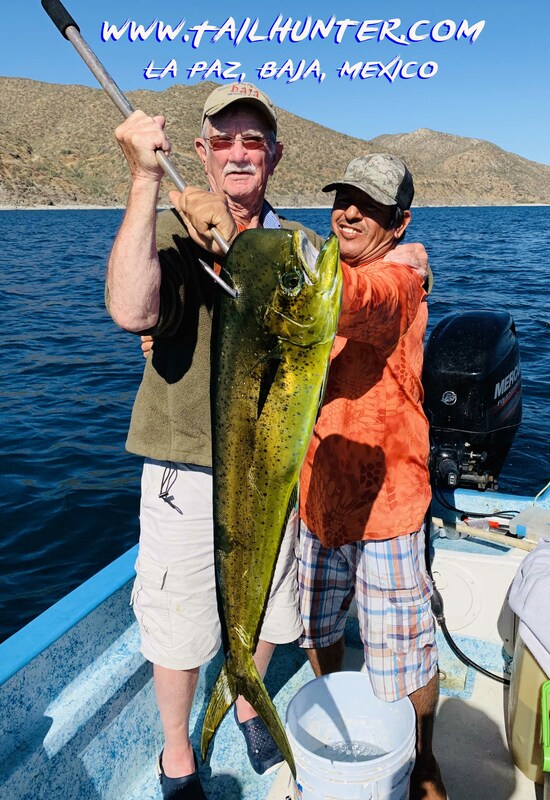 Surprisingly, however, given it’s winter and waters are chillier than normal, we got into some decent school-sized dorado. Bait is difficult to get because of the winds and choppy surf, but dragging lures has been productive. 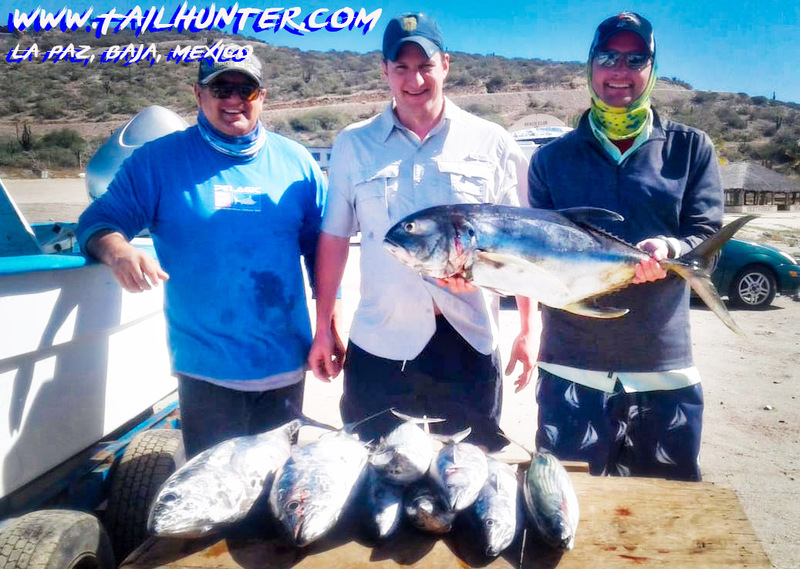 In addition to the dorado, tasty white bonito provided some great action. 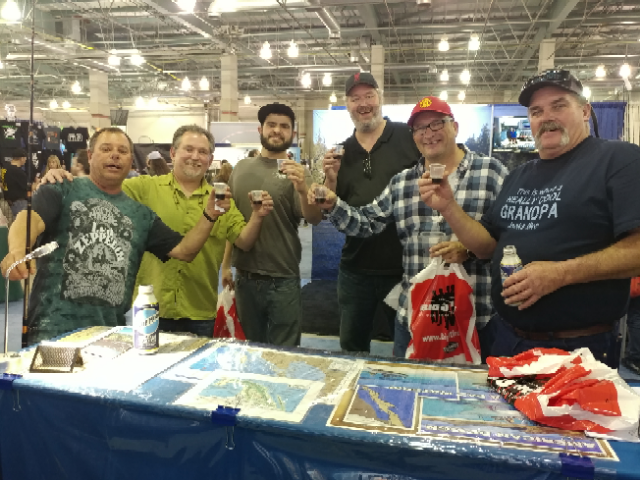 Many folks are surprised that the white bonito are not just great sport, but also pretty good eating! Add in some tough jack crevalle and a few firecracker yellowtail, sierra and cabrilla off the rocks and there were actually some nice catches. 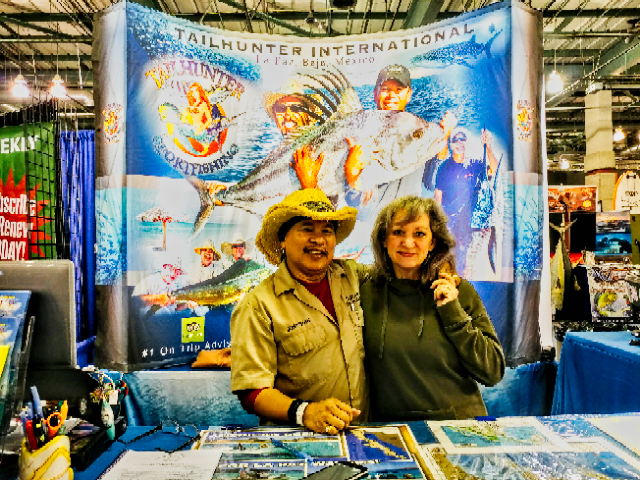 Just finished up our Sacramento Show for the International Sportsmans Expo that was at the state fairgrounds. It was off-the-hook! Jill and I stood and talked non-stop for 10 hours-a-day until we were hoarse! It was great. So many friends and new amigos. Lots of bookings for this year. If you’re planning on coming fishing with us, don’t wait. Dates are filling FAST! I’m not kidding. Bookings are coming in daily and we’re booking dozens at every show. Don’t wait. Some dates are filled or filling fast. If you wait until we come to a show near you, it might be too late! If you’re reading this, we’re actually probably on the road driving from Sacramento to our next show at the Washington State Fairgrounds in Puyallup, Washington just south of Seattle. This is the largest show in Washington and goes a whopping 5 days from Wednesday to Sunday. We always look forward to it. Some of our crazy Tailhunter Tribe! Cheers! Jill and I will be in the booth every day so come by and let’s talk about coming to visit us in La Paz! Don’t forget. 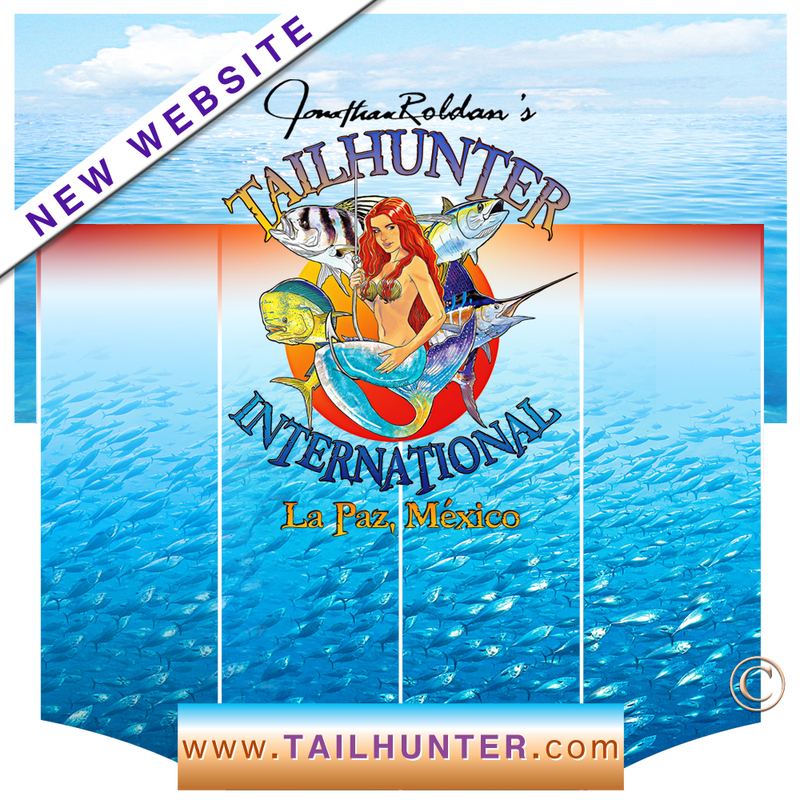 Our newly remodeled Tailhunter Website is now up and rolling and we’re pretty excited. It’s still got a glitch or two that we’re working out, but it’s ready for you to check out! Hope you have a great week and maybe we’ll see you in Washington this week too!